So, after about 24 hours if traveling, I finally arrived in Ulaanbaatar Saturday night. Although this week has been filled with meetings to which I’ve mainly gone by car, I had a chance to go out for a walk on Sunday. The part of Ulaanbaatar that I’ve seen is really nice. Apparently, the Russians made a replica of St Petersburg’s main square, so there is a rather grandiose square in the center of the city with an operas and theaters around it. 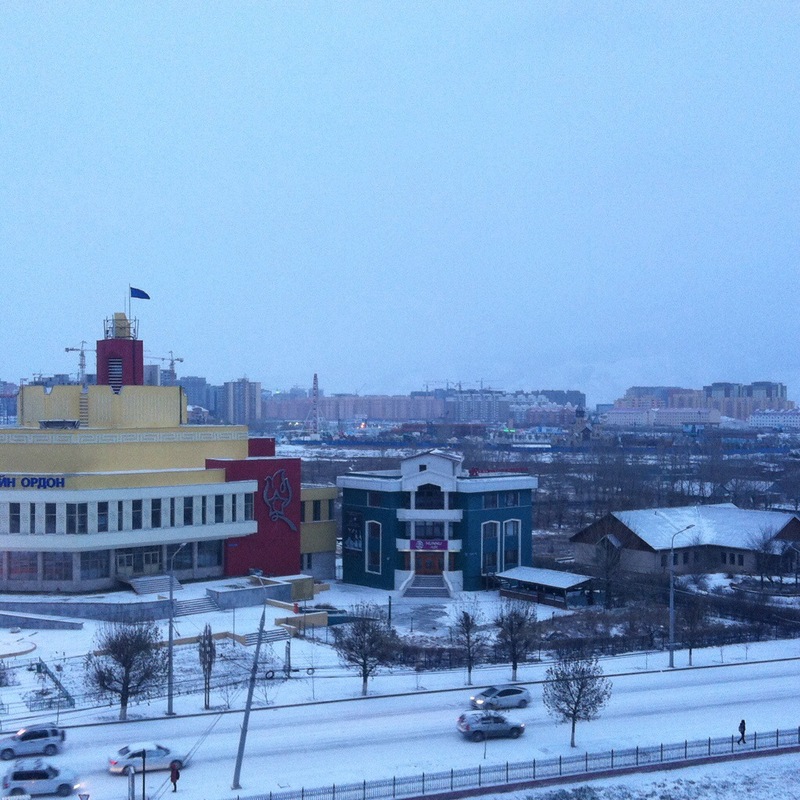 Ulaanbaatar has about 1.2 million inhabitants and it does have a big city feel to it. And it’s diverse history is on display throughout the city: Russian classic architecture is mixed with Soviet Style concrete apartment blocks, ghers (yurts), East Asian decorative structures, and modern office buildings with glass facades. People are extremely mild in their manners and very kind towards one another, in a very different way than I’m used to from elsewhere. Ulaanbaatar’s inhabitants are also more globalized urban than I expected: well dressed (probably an effect of their cashmere and garment industries) and with smart phones, and there are Priuses everywhere (fuel is quite expensive here). The weather is nice, it snowed Monday night and the city turned white. As a Swede who haven’t seem much snow for the past years, I love it of course! Today, we’re going to Northern Mongolia for three days, to meet herders and farmers. It’s almost unreal to be here! Sarah was so kind to make me awar of your blog. Actually, I would like to contact you by email or skype to ask for your advice with regard to the outcome of WMIP in Kyrgyzstan which once upona time we have prepared together and for which I am now supposed to prepare the ICR. Would appreciate to connect again to you.